I can't even count the number of times that I have followed recipes for pasta using a food processor, only to discover that no matter the care I took with the measurements, my dough was just a bit too dry (add water). Now it's too wet, (add flour). Aargghh, I could have traveled to Italy by now! I'd like to use my food processor, but this is starting to make me nuts. I always dust the dough with flour before running it through the machine, and then again as needed, depending on whether it starts sticking to itself, the machine, or the work surface. As for the "foolproof" part of your question: foolproof is, in my opinion, a product of confidence. Build confidence by practicing, often and repeatedly. After a while, you will likely find that you stop measuring, adding ingredients by feel and instinct, rather than measure. Wow, the quality of your questions is eclipsed only by your humor and beauty. I just might be able to help. The key is using a high-quality digital scale. Sure, there are perfectly good chefs out there that dump flour onto a previously clean work surface, do fancy things with their fingers to achieve the same result, but who’s got time for that? Here's my absolutely never fail method. I spent months playing around with homemade pasta before I eventually settled on this super-easy, foolproof method. It's a lot of fun and I don’t think that the messy method will ever achieve better results. Step one. Tare your scale with a liquid measuring cup. I just use a measuring cup 'cause it's easy to pour. Crack in your eggs, figure about 1 egg per serving. 3-6 eggs is a nice easy to handle amount. Write down the weight of the eggs in grams (absolute precision is what makes this method work so well). After noting the weight of the eggs, add 1 tsp olive oil per egg. Take your noted weight and multiply by 1.5. That is exactly how much flour to use. I like 00 flour the best (more on that in a bit), but all-purpose flour is fine. Put the food processor bowl, blade and all, on the scale, then tare and add to the bowl exactly 1.5 times the weight of the eggs. Salt is optional. Some chefs insist on it, others say to NEVER add salt. I do. After achieving the perfect amount of flour I add about a teaspoon (or 5 grams) of salt per 3 eggs. Now just process the flour while slowly adding the eggs. About 10 seconds is all it takes. You now have perfect rough pasta dough. Knead. Use as little flour as possible to keep it from sticking. When you need a rest from kneading, your dough does too. Roll it in a ball and wrap it in plastic wrap. Let it sit on the counter for an hour (30 minutes may be adequate, though I always want the longer break) or up to 2 days in the fridge. If you refrigerate it, let it come to room temperature before the second kneading. After you and the dough have had a rest, knead it again, try to keep it up for 5 minutes. Now you are ready to shape the pasta. Do you have a pasta rolling machine? I couldn't find one anywhere in the state of Alaska except in a little Italian shop in Wasilla (yes, home of Sarah Palin). Oh well, I was due for a drive anyway. Strangely, it was made in China. Anyway, the price was right and I have been very happy with it. Here it is: the Norpro 1049R Pasta Machine aka "the little red machine". This video does a very good job demonstrating how to use the machine (though the host needs to clamp it tighter -- that wobbling would drive me nuts). Also, the cutting mechanism on my pasta machine is useless; I just roll the sheet and use a knife to cut fettuccine, or I make ravioli or lasagna. No machine? No worries, you really don’t need one. Your pasta may be a bit on the thick side, but that only shouts ‘homemade’! Just roll it out using a rolling pin or a dowel. 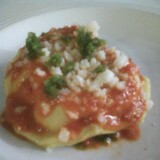 The most impressive easy thing I've made lately is this: Mario Batali recipe, ravioli with an egg yolk hidden inside. It's unbelievably easy to make. One thing that I do a bit differently is pipe some of the ricotta filling on top of the yolk too, to completely encapsulate it. About the flour: It may be hard to find 00 flour, but it does make better pasta. It's an Italian product, finely milled flour produced especially for pasta or pizza dough. These are not Batali's recipe, I made it up as I cooked, but the only key is not breaking the yolk.